critical thinking – How to Shape Human Behavior. System 1 – the unconscious – which is the autonomous, primitive and labour-intensive part of our animalistic brains that developed early in our evolutionary. Most of what we do are automatically triggered by things in our environment. Some of our behavior under this system are instinctive, while other behaviors- such as driving a car- require practice until they become second nature. System 2 – the conscious – the slower, more indepth thinking process developed much later in human evolution to override system 1 and allow us to take the time to stop and think about certain things. This system can often times override system 1 thinking, allowing us to prevent ourselves from doing stupid things. 00:02:03 Confabulation is a controversial theory that most of what humans do is done automatically and without thought or reason, and it is the human who creates a story about why he or she did what they did. With lying, the person intends to deceive and mislead; with confabulation, the person presents incorrect memories and alterations for which they are certain are the truth. Confabulation is controversial because it insinuates lack of free will. 00:07:43 Psychology makes a big deal about mindfulness and mindlessness. Thing is, as your system 1 is so labor-intensive and can only focus on one thing at a time, it’s impossible to think about everything; you have to know how to properly allocate your resources. A person could have a ton of information and facts in their head, but not know how to use and apply that information properly , therefore we must separate rationality from intelligence. 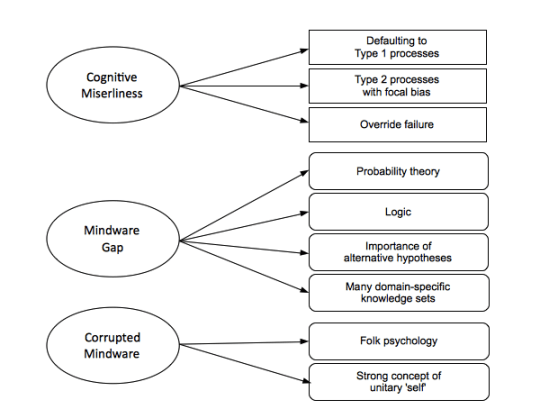 Cognitive miserliness – the human mind is so complicated and hard to use that people have a tendancy to rely too heavily on your unconscious, system 1 processing. 00:24:30 One of the biggest weaknesses of all of us is that we always focus on what does happen and and not on what didn’t happen; sometimes it’s what didn’t happen that is the most important part to think about. Meaning, just because our prediction came true doesn’t really show us much until we understand what the alternatives would have been. Function words are the frequently used words that connect content words to form full sentences. With these, the human eye naturally glazes over them to get to the content words. Content words – the important words that are the reason you’re reading the text in the first place; i.e. nouns and verbs. 00:34:40 People show greater rememberance for the beginning of a text (the primacy effect) and and for the end of a text (the recency effect). 00:36:20 Simultaneous-Contrast is the fact that things appear darker when contrasted against an opposite, lighter thing. Belief perserverence, a form of confirmation bias, is the idea that once you’ve created a belief, it’s almost impossible to undo it. For example, a group of sociologists from Stanford University conducted an experiment where they gave people a bundle of real and fabricated suicide letters to a person and asked that person to sort the real suicide letters from the fake suicide letters. In reality 100% of the suicide letters were fake. Those participants were then placed into two groups, those who were told that they ‘got 80% correct,’ and those who were told that they ‘got 20% correct.’ The sociologists then asked those people to explain how they got such a high/low percentage correct. Those participants then went on to justify their % correct through different beliefs as to why: “I’ve always been a sensitive person,” or “I’ve never been really good at connecting with people,” etc. After the testing the individuals were then told that they were tricked, and that in fact 100% of the suicide notes were fake. Weeks later those same participants were asked to return to perform the same experiment, and despite knowing that the initial test and % correct were wrong, they still maintained their initial belief and justification. The takeaway, once you’ve organized your life around a certain belief, your memory takes over and the next time you’re confronted with this situation, or a similar-enough situation, the initial justifications that form the foundation of your belief are what come to your mind, regardless of whether they are accurate or not. Once we have been fooled into believing one thing, it can be very hard to change your perspective and get you out of this belief. This is the power of belief perserverence. An important distinction, however, must be made between strength of proof and strength of belief. The Psychology Of The Psychic by David F. Marks includes three chapters discussing the phenomenon of remote-viewing: the ability to project to another person’s location and see what that person is seeing. The fallacy of personal validation involves asking the person whom the psychic is reading to judge for him or herself whether or not the psychic’s insight into that person’s life is accurate or not. This form of validation is so subjective and malleable using linguistics that it is among the least reliable forms of validation because subjective validation, or the personal validation effect, is “a cognitive bias by which a person will consider a statement or another piece of information to be correct if it has any personal meaning or significance to them.” Meaning, humans have a tendency to overlook things that don’t coincide with their belief and notice things that do coincide with their belief/perception. Often times scientific journals publish articles releasing the results of scientific studies, and refuse to publish replications – articles which test and may disprove the validity of the originally published article. 00:20:00-00:49:47 Several examples from history. 00:49:54 The vividness problem is the effect that one piece of information, correct or incorrect, can have be enough to determine the entire outcome of a decision simply because that piece of information is so vivid. For example, you conduct hours of market research and consumer reports and are strongly considering buying a Ford Explorer, and when a trusted friend advises you against purchasing a Ford Explorer “because a friend of theirs once bought one and it turned out to be a complete lemon,” this vivid, personal piece of information is enough to override hundreds of statistics and dissuade you from buying the vehicle. 209. Self-Defense: What's The Most Effective Self-Defense System to Learn As Quickly As Possible?